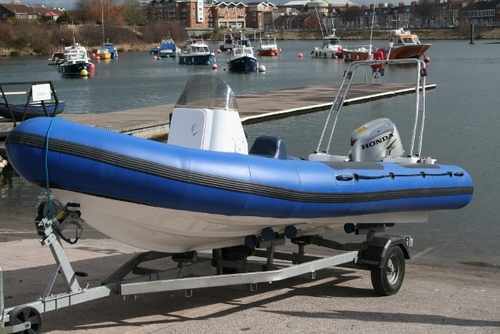 VITAL FACTORS WHEN DECIDING WHICH RIB TO BUY. 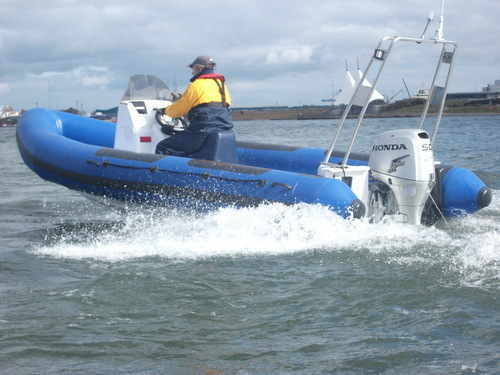 THIS ENABLES THE HULL TO PLANE EASILY WITH RELATIVELY LOW HORSEPOWER ENGINES EVEN WHEN FULLY LADEN , UNLIKE DEEP VEE HULLS WHICH REQUIRE LOADS OF POWER TO ENABLE THE HULL TO LIFT OUT OF THE WATER ! THE RAISED BOW IS PROMINENT IN THIS PHOTO ! THE SHUTTLE WILL BECOME A "FLYING MACHINE" ! 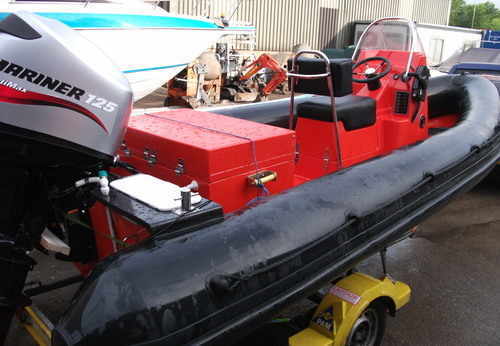 IT'S EASY TO SEE WHY IT'S BECOMING VERY POPULAR WITH DIVERS AND CLUBS.IT IS AN IDEAL BOAT FOR HIRE COMPANIES OR THE INDIVIDUAL. 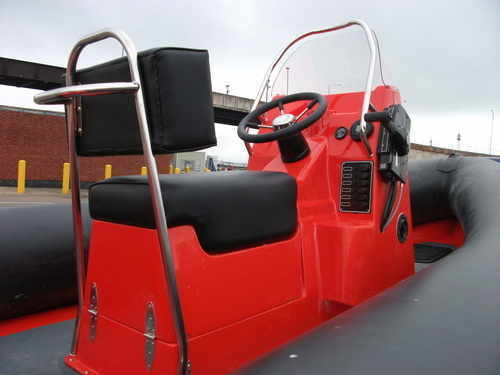 THE SHALLOW DRAFT MAKES IT PERFECT FOR SHALLOW SEAS OR LAKES WHERE "BOTTOMMING" COULD BE AN ISSUE ! 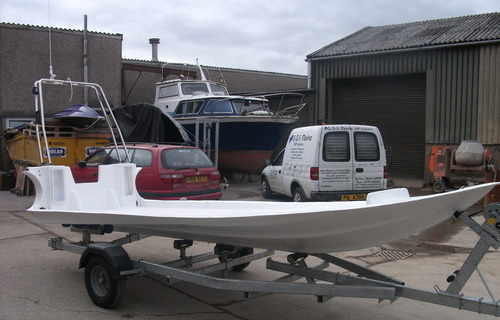 THIS BOAT CAN ACCOMMODATE SINGLE AND TWIN ENGINE SET UP'S AND CAN BE PURCHASED AS A DIY PROJECT OR AS A COMPLETED BOAT. SEATING AND CONSOLE OPTIONS ARE VARIED AND CAN BE IMPLEMENTED INTO YOUR CHOSEN PACKAGE , OR SOLD SEPERATELY FOR HOME COMPLETION.CONTACT US FOR MORE DETAILS. 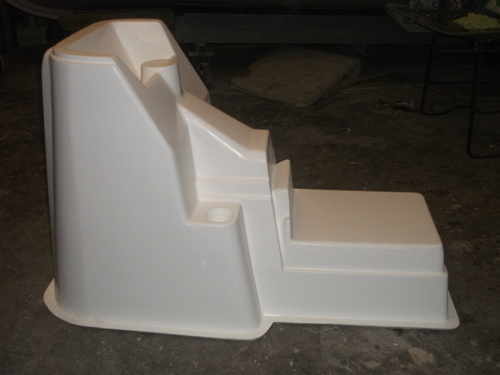 THE FIRST OFF JOCKEY CONSOLE MOULDING . 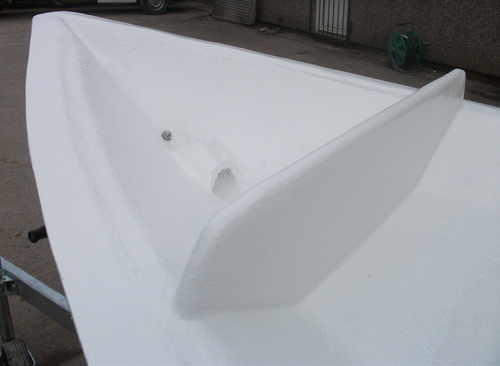 WE CAN MANUFACTURE AND SUPPLY ANY MOULDING REQUIREMENTS THAT YOU MAY HAVE ! CONTACT US FOR MORE INFORMATION. 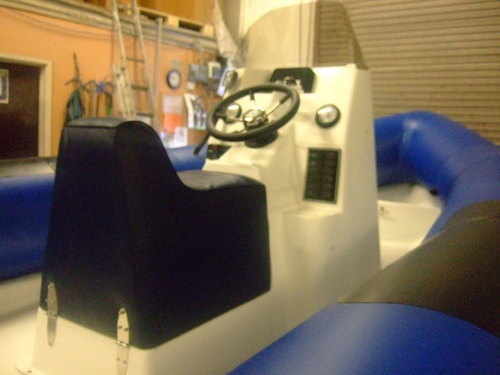 THE "ALL IN ONE " CONSOLE & JOCKEY SEAT . AND HAS LOADS OF LOCKABLE DRY STORAGE AND IS A LOVELY PIECE OF KIT ! 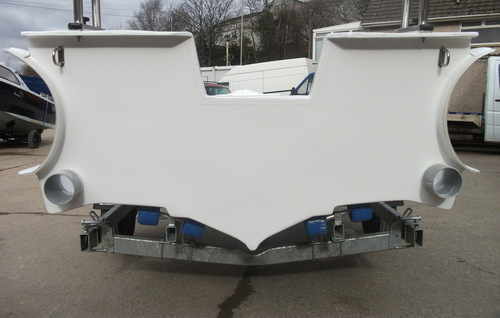 TRANSOM VIEW , COMPLETE WITH PIPES FITTED READY FOR THE DRAIN SOCKS. VIEW OF ANCHOR WELL , COMPLETE WITH MOULDED CLEAT ! ALL READY FOR TUBING ! HITCHED UP TO THE TRUCK AND READY TO BE LAUNCHED ! LAUNCHED AND READY TO GO ! 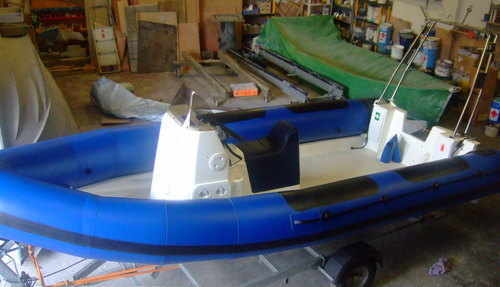 THE SHUTTLE 550 SHOWN ABOVE HAS HEAVY DUTY PVC TUBES FITTED TO IT.THESE ARE EXCELLENT VALUE FOR MONEY!THESE WERE SOURCED AND PURCHASED BY THE CUSTOMER DIRECT. 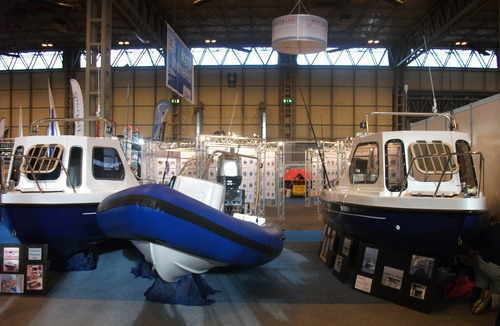 WE GENERALLY USE QUALITY HYPERLON TUBES, CUSTOM MADE FOR US BY TIDEL,IN A VARIETY OF COLOURS AND STYLES. THEY ARE ONE OF THE BEST TUBE MANUFACTURERS AROUND ! WITH A 7.5M BEING PLANNED! FOR PRICES AND INFO , JUST ASK ! A SHUTTLE 550 WITH A 125 XL OPTIMAX ON THE BACK ! 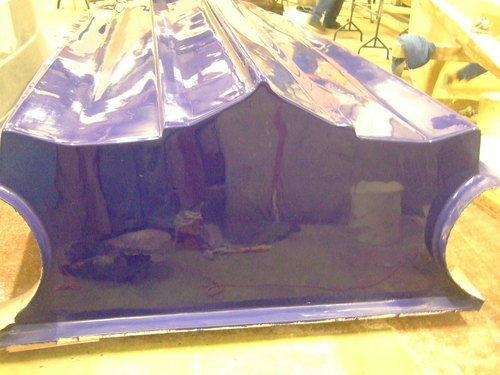 COMPLETE WITH REMOVEABLE LIVE FISH TANK . THE CONSOLE PROFILE, COMPLETE WITH STAINLESS GRABS.